The 2015 Ford F-150 jumped to 18 percent of all F-150s sold in January, a Ford executive said Tuesday, showing strong consumer interest in the vehicle that is complicating life for auto body shops. By Ford’s estimate, that interest and production growth will continue to the point where the the 2015 aluminum trucks will make up the majority of sales for the model by July 1. Ford U.S. sales analyst Erich Merkle revealed the proportion during a conference call (available for replay here) to discuss January sales figures released earlier that day. The aluminum trucks were only 5 percent of F-150s sold in December, according to Ford President and CEO Mark Fields. Some of the increase can probably be attributed by more F-150s being made available as Ford continues to smooth out and ramp up its production. Still, it indicates the 2015 model year of the popular truck isn’t sitting on the lot. Far from it, actually. The 2015 F-150s sat at dealerships for an average of 12 days, and high-end models moved out even faster, with the King Ranches and Platinums gone in 10 and nine days, respectively. Merkle said there’d been a “strong response” to the trucks, which were the “fastest-turning” Ford vehicle for a second month. 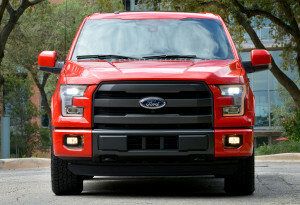 The F series of trucks in general sold 17 percent more than last January with 54,370. It was the best F-series January increase since 2004. Overall Ford sales also increased by the most since 2004. “We are extremely pleased with F-series performance,” Merkle said. He noted that F-series truck sales could stay “tempered” a little until the Kansas City plant gets fully online. That should happen this quarter, Merkle said. “More F-150s are on the way,” he said. Merkle said it was “too early” for any real takeaways from the 2015 F-150s, but the company was happy so far. F-150 sales prices overall were up $2,100 from January 2013, though Merkle wouldn’t provide a breakdown of how much of an increase the new F-150 was seeing. Live event replay: Here is the feed of Twitter updates from the call and other Ford-related news.